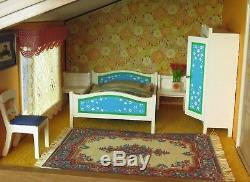 A fantastic vintage 1970's Lundby Gothenburg electrical doll's house. 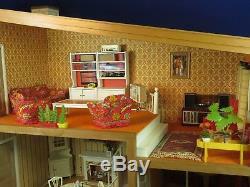 Fully furnished with original Lundby furniture and complete with all original super seventies wallpapers and floor coverings. 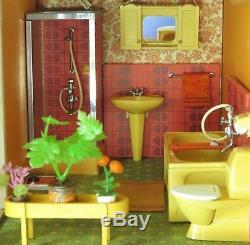 Full bathroom suite (shower cubicle, bath, sink, toilet and vanity wall cabinet with electric light). Soap, nail brush & bath rack. Electric ceiling light for bathroom one wire loose. Dining room Royal Gold table and four chairs. Occasional table (paint worn to top). Flan on silver plated salver. Tall fridge and top cupboard. 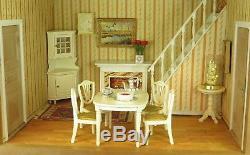 Red kitchen settle bench seat. 4 coffee cups, saucers and side plates with napkins & spoons. Plate rack, clock & jelly mould attached to wall. Blue Heaven Bed & linen linen discolured and would benefit from being laundered! Blue Heaven bedside cabinets x 2 one with a little paint loss. Three piece living room suite. 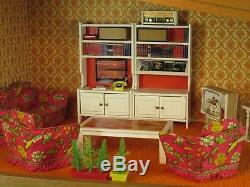 2 x white wall unit bookshelves. 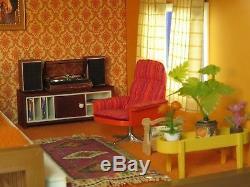 Super cool stereo system with speakers and base unit. 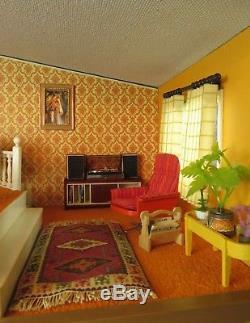 Groovy striped orange swivel chair. Magazine rack with Swedish newspapers. Plant stand with three plants. Six rugs various patterns and sizes. Two standard lamps one with loose wire to plug. Yellow crystal table lamp has had a repair to base. Blue base table lamp and decorated shade. Brass base table lamp with orange shade. Rise and fall style ceiling light. Pair of wall mounted lights. Orange "tiled" coffee table staining to tiling. Pots, pans and spatula and frying pan with eggs. 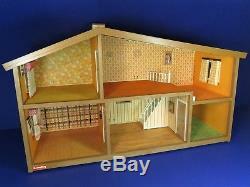 House and contents in very good vintage condition some expected signs of wear commensurate with age and use and some residual marks to walls from blu-tack and a tiny tear to the edge of the dining room flooring all easily disguised with clever placement of furniture or fittings. 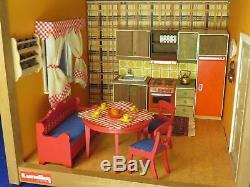 Totally cool split level mid century modern Scandinavian design living experience for your dolls! Please see photos as part of condition report. Thanks for looking, please message me with any questions you may have. 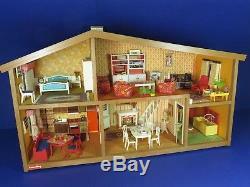 The item "Fantastic Vintage 1970's Lundby Gothenburg Fully Furnished Electric Dolls House" is in sale since Sunday, March 18, 2018. 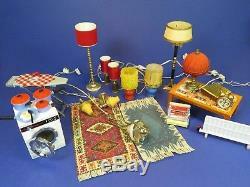 This item is in the category "Dolls & Bears\Dolls' Miniatures & Houses\Vintage Items". 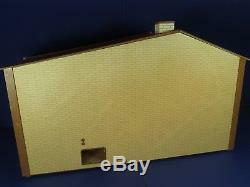 The seller is "gingganggoollie" and is located in Dunkeld, Perthshire and Kinross.